Brings the full power of your internet connection to right where you need it. With the advent of 4K video streaming and Ultra HD gaming, the devolo GigaGate has been designed with the next generation of home entertainment in mind. It brings the full power of your internet connection to right where you need it, carrying your router’s signal over a lightning-fast 2Gbps connection for an unmatched entertainment experience anywhere in your home. It’s a powerful solution for a connected home that offers huge bandwidth, extreme WiFi range and a dedicated high-speed gigabit port for even the most demanding of today’s connected devices. The GigaGate offers a huge 2Gbps connection rate with unrivalled speed for the best possible multimedia experience. Dedicated Ethernet ports and a separate WiFi access point allow games consoles, high-definition smart TVs and other bandwidth-hungry devices to be run at the same time with no loss of performance. An integrated high-speed gigabit LAN port gives high-performance devices a dedicated 1-gigabit pipeline, while four fast Ethernet ports provide additional connectivity for cable-based devices. A Complete Home Network Solution! Up to eight satellite devices can be connected, not only from one room to another but also from building to building, for a complete home network solution. What’s more, installation could not be simpler; set up, connect and enjoy the ultimate home entertainment experience. The latest 4x4 Quantenna technology provides high-performance, point-to-point connection over the 5GHz band with maximum network security thanks to AES encryption, making GigaGate fast, secure and safe. The GigaGate uses a base unit and a satellite device to deliver interference-free, pinpoint-accurate connectivity to smart TVs, games consoles and media centres, with a dedicated WiFi access point to keep all of your devices online. By separating high-usage devices from the WiFi network, you’ll enjoy more bandwidth for your wireless devices while maintaining peak performance levels for your home entertainment system. You’ll be able to stream movies in full 4K Ultra HD with no interruptions, even if laptops, tablets and smartphones are being used elsewhere around your home. Your whole family can finally enjoy a stress-free multimedia experience anywhere in your home with devolo GigaGate. devolo GigaGate: Full-speed internet always exactly where you want it! Does the product offer a WiFi access point? 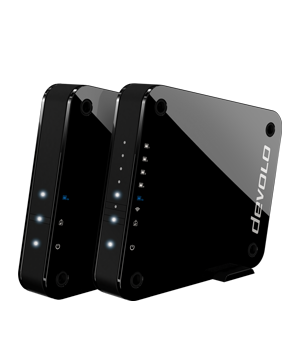 devolo GigaGate products provide a full-fledged Wi-Fi access point. Which devices can I connect to devolo GigaGate? You can connect any current device (gaming console, smart tv, internet radio, computer, NAS, cloud, server, tablet, smartphone) with a Wi-Fi module or an integrated LAN port to devolo GigaGate - giving you a fast connection to the Internet and your home network. 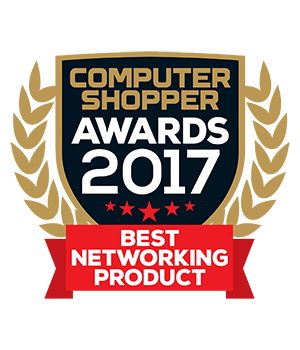 You can network appropriately equipped consumer electronics in no time. How many devolo GigaGate SATELLITES can I add to my home network? Up to eight SATELLITE devices can be connected, not only from one room to another but also from building to building, for a complete home network solution. How do devolo GigaGate devices behave in the event of power surges (such as lightning strikes)? devolo products are protected from overvoltages and power surges in the mains supply network according to national and EU-wide regulations and standards. Compliance with these regulations is reviewed and confirmed by independent accredited laboratories. devolo products are always safe, i.e. the devices never pose a danger, even in the event of a power surge.In rare cases, local power surges (e.g. nearby lightning strike) may exceed the defined voltage level. In these cases, the built-in surge protection that is a feature of devolo products is activated to avoid further damage. The device usually becomes inoperable in the process.Connected devices (via network cable or the integrated power outlet) are not protected by this feature. Here, we recommend connecting a power strip with surge protection.